Last week Trent, a Flowerdale resident and passionate campaigner against logging of threatened species habitat, took us on a tour of some of his favourite spots in the Mountain Ash forests near Toolangi. After walking through some wonderful tree-fern gullies, we quietly settled ourselves in near a large dead tree trunk (stag) just on dusk. It was not long before a Mountain Brushtail Possum was revealed by Trent’s head-torch, clinging to a hollow spout near the top of the stag. 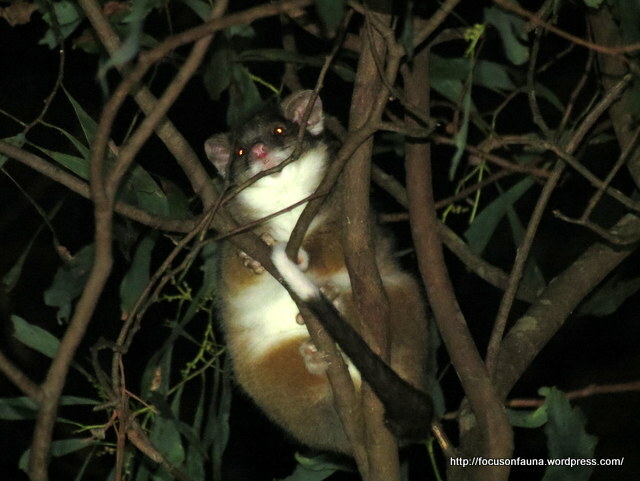 Almost immediately a rustling of branches alerted us to a Common Ringtail Possum right above us. 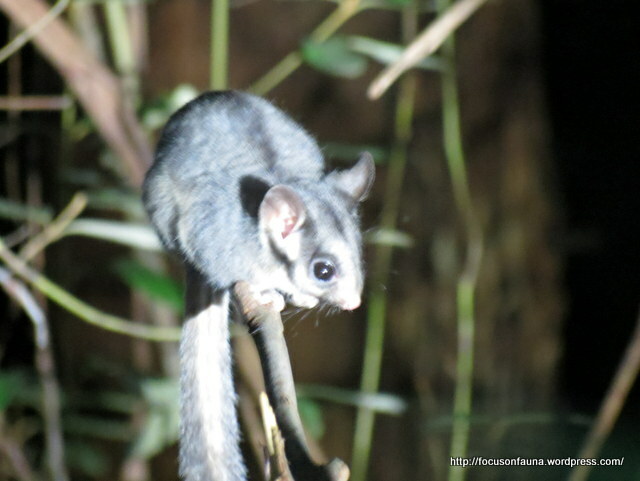 Then, a short while later, Trent’s excited whisper indicated what we had hoped for, but not really expected – a Leadbeater’s Possum (Gymnobelideus leadbeateri) in the glow of our torches, leaping and scampering through the tangled undergrowth. This amazing little possum shares the role of Victoria’s faunal emblem with the critically endangered Helmeted Honeyeater and is the State’s only endemic mammal. Its numbers have declined drastically in recent years, particularly after the Black Saturday fires. Conservationists and wildlife researchers warn that the Leadbeater’s Possum is being pushed towards extinction by the loss of suitable habitat containing large hollow-bearing trees vital for nesting – a situation exacerbated by fire and by logging within its limited range in the Central Highlands. Being unable to glide, the Leadbeater’s Possum needs a dense interwoven understorey to facilitate travel by running, leaping and climbing, as seen in the video. Fantastic video, I’m amazed that the Leadbeaters possum stayed around long enough to get that much footage. Is this animal in one of the coups that is destined to be logged out? How much time does our State emblem have left here? Not in one of the proposed coups, Steve, but not far away. In answer to your second question, not a lot if habitat continues to be destroyed or degraded! Great footage fella’s, and well done Trent on all the time and effort you’ve been putting into helping protect these wonderful little creatures. Interesting that it didn’t seem bothered by the spotlight. What sort were you using? Did you have the direct beam focused away from it? Amazing clip… all those little jumps. Beautiful. We just had LED head torches, Suzie, so not too powerful – Trent’s was attached to his camera. He actually first picked up the Leadbeater’s Possum on his thermal imaging camera. Fantastic video. The logging has to be ceased and those forests protected in perpetuity.